1. Students will create a watercolor pointillism painting based on Georges Seurat’s artwork. 2. 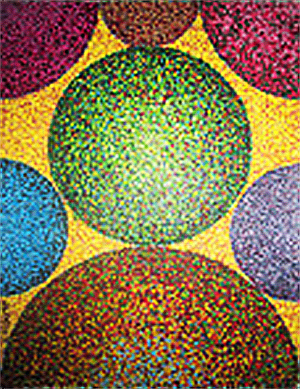 Students will learn about pointillism and apply this new technique to produce a piece of artwork. 3. Students will re-visit/learn color theory – primary colors, secondary colors, complementary colors, and how to mix and create colors. 4. Students will strengthen their drawing skills. Get out: rough draft paper, 12x18" (30.5 x 45.7 cm) white paper, watercolor paints, Q-Tips, newspaper, paper towels, water cups, and examples of Georges Seurat’s artwork. Make sure to have enough copies of Georges Seurat’s biography for each student. Discuss and read about Georges Seurat. Discuss and make a class list of different rain forest and jungle animals. Teacher will show example of project and examples of Georges Seurat’s artwork. Students will draw a rough draft of a jungle or rain forest animal plus a background environment. Students will draw their final copy of their animal and background on good white 12x18" paper. 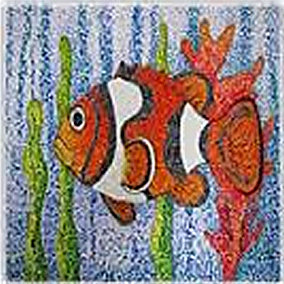 Teacher will demonstrate how to create a pointillism painting using Q-Tips and watercolors. Teacher will explain how to physically mix colors together and how you can visually mix colors, by placing colored dots next to one another. Students will begin painting their pictures using the pointillism technique. Students will continue to paint their pictures. Students will finish painting their pictures. Once the paints are dry, students have the option to outline, with marker, their pictures and background. Covering all items by questions and answers. Work on more simple drawings. The ratio of the red points comparing with the blue ones. Discuss the differences between Van Gogh’s technique and pointillism.